This fan-site is in no way directly involved with Kimi Raikkonen, his management or race team. KRS is an independent website dedicated to the driver with the sole purpose of providing a place of all news to his fans. Stories, articles and reports always state their sources. All thoughts and opinions expressed by the editor (Evenstar) do not respresent Kimi, except for his official columns and press release comments which are shared onto the blog. Kimi Raikkonen Space was created by a fan called Saima, her online alias being Evenstar. Since the blog began in 2005, KRS aimed to provide for all Kimi fans interested in the latest news about his career, along with other miscellany such as wallpapers, interviews, videos and tributes. The most anti-cipated feature on the site were the Grand Prix highlight videos from 2007-2009 which were made specifically for Kimi fans and uploaded after every race. This fan-site also held the biggest photo archive of Kimi (on Skydrive which has now changed to OneDrive, unfortunately losing it’s public availability settings.) KRS includes other information and statistics that are updated consistently throughout a season (we try!) . In her 16 years of support for the enigmatic Finnish driver dubbed ‘Iceman’, Evenstar was voted The Biggest Kimi fan on the Official Kimi Raikkonen Forum in 2005 and 2007. The popular F1Fanatic website also shared similar sentiments. Since Evenstar began watching Formula One from around 1997-1999, her passion for the sport and for her favourite driver grew. She found writing the best form of expressing this through race reports and articles on Kimi’s career. Deciding to put them to use here and share them with fans all over the world, Evenstar combined her Journalism studies and her love for F1 by blogging/writing articles on Kimi’s performances and general F1 stories. The race reviews stopped after Kimi took a sabbatical from F1. Evenstar has a passion for video editing and produced her very own F1 season highlight videos and tributes, some reaching over a thousand downloads each. During the middle of 2008 however, the videos took a hiatus due to other personal and important demands. In 2009 Evenstar continued to document Kimi’s Ferrari career till the end before he left F1. Design has also been a long time passion of Evenstar, using Photoshop. This led to producing a Kimi fan shop which had a successful start in 2008 with the only Kimi calendar designed and created especially for fans being delivered all over the world in USA, Australia, Europe and parts of Asia. The trend continued with the 2009 Limited Edition calendar, where only 50 were produced and all had been sold out. Evenstar later designed a career special 2014 calendar, where only 100 were made. During the official opening of the Ferrari Store in London on 6th May 2009, Evenstar received Kimi Raikkonen’s autograph on her 2009 calendar and managed to pass a DVD by hand to Kimi personally, which contained her F1 tribute videos on his career (you can watch and read all about that crazy encounter here). Gallery of Evenstar’s visit to the 2015 Abu Dhabi GP – where she finally got a photograph with her hero! It was announced in the late evening of 17th November 2009 that Kimi would take a sabbatical from F1 in 2010. However, in 2010 the Iceman decided to participate in the World Rally Championship for the first time, with Citroen and Finnish co-driver Kaj Lindstrom, after their new deal was announced on 4th December 2009. He continued rallying into 2010 and 2011, also setting up his own motocross racing team named after the Citroen-based rally team Ice1 Racing. With rallying looking like more of a challenging long-term commitment, Kimi decided to try his hand at other forms of motorsport while he could and subsquently headed to the United States for a couple of Nascar races in mid-2011. The Iceman Returns… And So Does KRS! After much speculation and reports of an F1 comeback with Williams F1 team, the deal fell through and Kimi and his management were approached by Lotus Renault (Gerard Lopez and Eric Boullier). On the 29th November 2011, Kimi’s long awaited return to Formula 1 was announced with Lotus Renault GP, confirming Kimi as their driver for 2012 alongside Romain Grosjean in a two-year contract. KRS was instantly revived with Kimi’s return and reached more fans than ever; the website received over 855,827 views in 2012 alone, the busiest day being Kimi’s win at the Abu Dhabi GP. The edited videos also made a comeback in 2012 and 2013, a three-part tribute entitled ‘The Iceman Returns‘. The Prelude is the most popular first-part video; it portrays the wished comeback of Kimi in a dream-like vision, covering Kimi’s departure from F1 into the WRC and Nascar but leading back to his legacy in F1 – which holds his true passion for racing. As of September 2015, KRS took a break after Evenstar decided to protest against Ferrari’s treatment of Kimi. 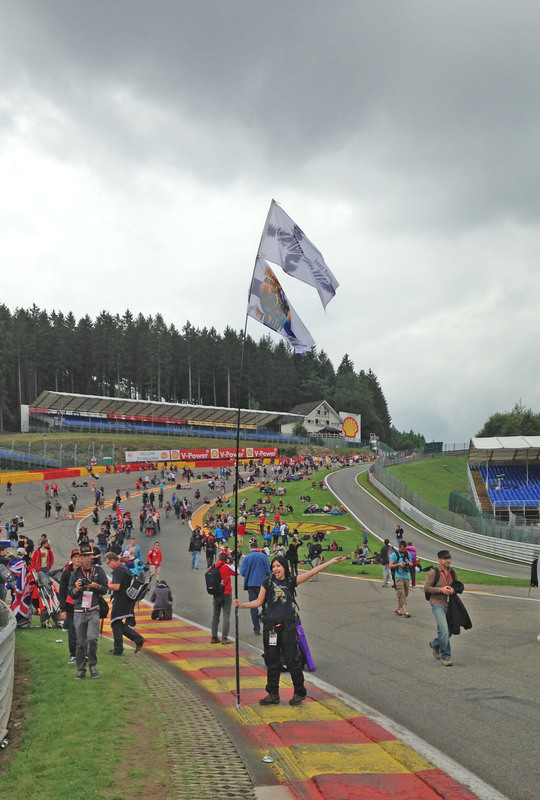 However KRS maintained following Kimi’s career with fans on social media. 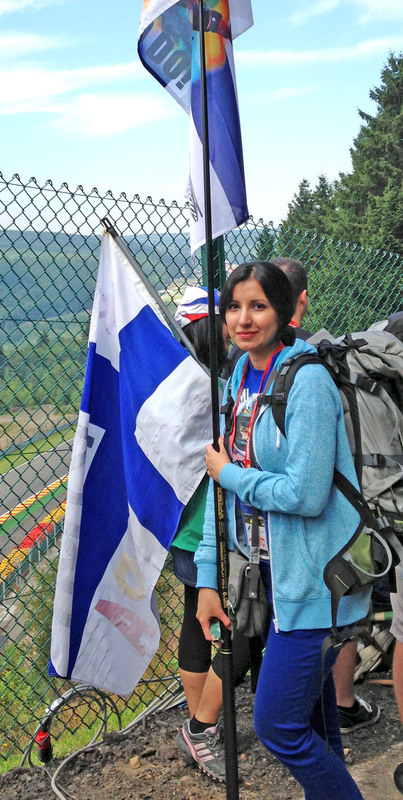 She continued to passionately support Kimi by attending F1 events and Grands Prix. Here are her flags which were snapped at the F1 Live London event by official Ferrari photographer Callo Albanese. After Kimi was confirmed to be continuing F1 with Alfa Romeo/Sauber for at least two more years once leaving Scuderia Ferrari at end of the 2018 season, Evenstar decided that she may blog again. Here are some comments from readers since the early years when KimiRaikkonenSpace.com was Darkmaiden.Spaces.Live.com – thanks for the support guys! Ionut Bratu wrote: “Superb as usual. Thanks for the clip”.